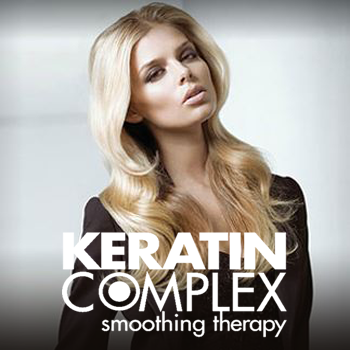 Experience unbelievably straight and silky smooth hair with Keratin Complex Keratin Smoothing Treatments by Coppola! At Atelier Hair Salon in San Diego we understand the challenges of frizzy, untameable hair! If you are tired of battling frizz and uncontrollable curl every morning, a keratin treatment is the answer! Keratin treatments and styling products are specially formulated to contain natural keratin protein, which rebuilds, restores and rejuvenates all types of hair. Say good bye to unruly hair and hello to soft, smooth manageable hair that will last for months. A Keratin Complex keratin treatment will make your hair almost maintenance free, easier and faster to blowdry, and prevent environmental toxins from entering your hair. This is the original, world-renowned hair smoothing treatment that transforms hair from out of control to perfectly smooth and silky. The results last for up to 5 months, and you can return for ongoing treatments to continue enjoying gorgeous manageable hair. Your hair will feel stronger and healthier following this smoothing therapy, and if you highlight or color your hair on a regular basis, you can schedule a keratin treatment immediately following your color service to help seal in the pigment for longer lasting vibrant color. This new service is a great alternative to the original Keratin Complex treatment, and perfect for our salon guests who would like to try a hair straightening treatment that can be completed in less time for an affordable price. The Express Blowout will leave your hair smooth and frizz free for approximately 5-6 weeks. The treatment is formaldehyde-free, OSHA approved, and infuses Keratin Protein into your hair for beautifully healthy locks with amazing shine and manageability.